As Duncan and I began our journey into parenthood, we had all sorts of grand notions of the type of parents we would be. Like other parents we know, we swore to each other that we would be the best possible role models. We promised to have all the best qualities we loved in our parents and none of the worst ones. We vowed to be fun, honest, and fair 24/7. And then Shiri was born. 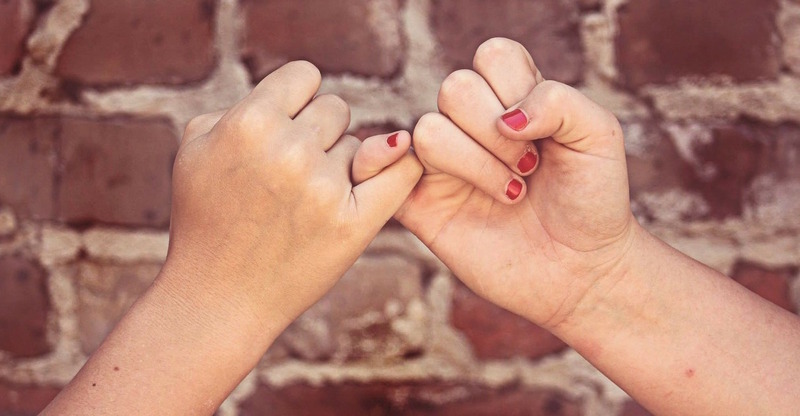 I’m not saying we went back on every promise, but we found out it was a lot harder to uphold those promises when we were living the reality of parenthood. Limiting our own screen time to after the baby was asleep in bed was great in theory; however, being up at all hours of the night with a newborn almost always meant a 4:00 a.m. Facebook check. We wanted to teach Shiri to be a healthy eater and to set healthy examples for her with our food and exercise choices, but some days just demand fries and a milkshake. We had vowed to act one way, and hard as we try, we still aren’t always in line with those expectations we set for ourselves. The problem with broken promises to ourselves is they often don’t have enough of an impact to really change our behavior. Think of New Year’s resolutions or simply trying to change a bad habit. The problem with broken promises to others is there’s often too much of an impact because of the resulting loss of trust in the relationship. Promises play a role in both of these sections. In Matot, certain types of vows are identified and explained, including vows of married couples to God and each other. In Masei, the tribes make requests of Moshe, and Moshe responds, vowing to give certain parcels of land to certain people. These are verbal agreements, once again showing the power of words. From the creation of the world through God’s word alone, to the myriad laws on how we use our words to create or destroy, the power of speech is identified as one of the unique gifts of a human being. More specifically, our human communication, when combined with our memory and our empathy, gives us the unique ability to create and enact self-imposed legislation. Put another way, our speech can represent not only the exchange of words, but the exchange of tangible, touchable things. The parshiyot this week remind us that our words have this power and that whether or not we can feel it, there is weight to the promises we make to ourselves and each other. Beautifully written ———–Shabbat Shalom, my friend. Agreed. We’ve experienced the same gap when promises to ourselves collide with reality. Ben, I’m so glad this resonated with you!